Today's surprising news that Pope Benedict XVI has announced his retirement has got us thinking of all things papal. Here are two devotional items from two rich amulet collections covered before in this blog - the Edward Lovett collection and the Adrien de Mortillet collection. Both were originally acquired by Henry Wellcome and subsequently transferred to the Pitt Rivers from the Wellcome Medical Institute in the 1980s. More than 300 of the Lovett amulets were selected by artist Felicity Powell for her 'Charmed Life' exhibition at Wellcome last year, which you'll have another chance to see when it opens at the Winchester Discovery Centre this weekend. 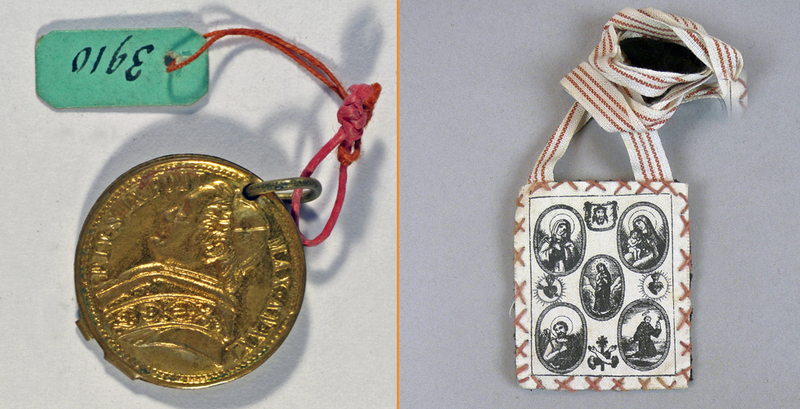 On the left is a circular gilt medallion stamped with a likeness of Pope Pius IX on one side and the Virgin Mary on the reverse. Pius was the longest-reigning Pope to date, holding office for almost 32 years (1846 - 1878). He convened the First Vatican Council in 1869, which decreed papal infallibility. On the right is a scapular in wool and cotton. Scapulars (from the Latin for 'shoulder') were introduced by the Carmelite monks in the Middle Ages and later formed part of the habit of various monastic orders. They evoke the shape of an apron - denoting one's commitment to serve - and offer protection, both in life and after death. Pope John Paul II wore one all his life. The flaming heart, or Sacred Heart, is a common design on scapulars, along with printed images of Mary and Jesus. This example from the de Mortillet collection is said to have come from St Peter's in Rome. When shall we see the white smoke rise up from the Vatican, signalling the election of a new Pope? We wait and see!